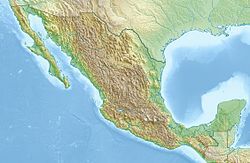 The 1999 Tehuacán earthquake, or the 1999 Central Mexico earthquake, occurred on June 15 at 15:42 local time (20:42 UTC) near Tehuacán, Puebla, Mexico, close to the state of Oaxaca. The earthquake measured 7.0 on the moment magnitude scale. Fourteen people were reported dead, and many historic buildings and monuments were damaged. 5,306 houses were destroyed, 15,688 partially damaged, and 9,682 slightly damaged. Many houses collapsed in the state of Puebla, including parts of the Puebla City Hall. The state of Puebla was declared a disaster area. The Cocos Plate is subducting beneath the North American Plate in the Middle America Trench. This was an intraslab earthquake, and the epicenter had some distance from the Middle American Trench. This was the tenth earthquake since 1864 with magnitude larger than 6.5 and similar location of epicenter. ^ a b c Dillon, Sam (June 16, 1999). "Earthquake Kills 14 in Mexico And Injures Dozens in Puebla". The New York Times. Retrieved October 19, 2012. ^ Sheridan, Mary Beth (June 16, 1999). "6.7 Temblor in Mexico Kills 12". Los Angeles Times. Retrieved October 19, 2012. This page was last edited on 8 March 2019, at 21:40 (UTC).